Robert Clatworthy, R.A. [b.1928] studied at the Chelsea School of Art at the same time as Elisabeth Frink before moving on to the Slade. He joined the renowned Hanover Gallery [London] straight after leaving college, showing, with great success, alongside Bacon, Giacometti, Picasso, Richier and Arp. In the early 1960s he moved to the Waddington Gallery [London] where his work also proved very popular. Initially Clatworthy's sculpture focussed on animals, mainly cats, bulls, horses and dogs and in this area he is probably the greatest sculptor ever. He later started to concentrate more on heads and figures, taking them close to abstraction. These are very complex and require time to fully appreciate their quality. During the 1990s he developed a skin problem and was forced to temporarily abandon sculpture. Instead he concentrated on drawing and painting - heads, figures and a series of abstract paintings. 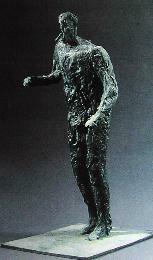 In 2001 he began sculpting again, quite a few sculptures have now been cast in bronze. His work is included in many public collections including the Tate Gallery, Arts Council, Victoria & Albert Museum, etc.